Well, you don’t have to be anymore. Life Strategies for Teens is the first guide to teenage life that won’t tell you what to do, or who to he, but rather how to live life best. Employing the techniques from Dr. Phil McGraw’s Life Strategies, his son Jay provides teens with the Ten Laws of Life that make the journey to adulthood an easier and more fulfilling trip. Whether dealing with the issues of popularity, peer pressure, ambition or ambivalence, Life Strategies for Teens is an enlightening guide to help teenagers not only stay afloat, but to thrive during these pivotal years. 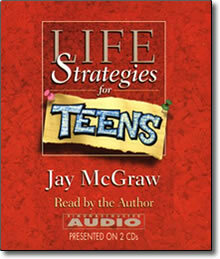 Whether you are a teen looking for a little help, or a parent or grandparent wanting to provide guidance, this book tackles the challenges of adolescence like no other, combining proven techniques for dealing with life’s obstacles and the youth and wit of writer Jay McGraw, Life Strategies for Teens is sure to improve the lives of all who listen to it.